"Tonight, we're taking Game Night up a notch." Warner Bros has released a new full-length trailer for the comedy Game Night, the murder mystery horror (maybe?) comedy movie which opens at the end of this month. This comedy puts a spin on the popular "game night" concept and turns it into a crazy wacky, violent thriller. When a group of friends who meet regularly for game nights discover that the murder mystery game they're playing this time is actually for real, everyone starts to freak out but soon realizes the only way to win is to keep playing. Jason Bateman and Rachel McAdams star as the main hosts, along with Billy Magnussen, Sharon Horgan, Lamorne Morris, Kylie Bunbury, Jesse Plemons, Danny Huston, with Michael C. Hall and Kyle Chandler. This looks totally over-the-top absurd, possibly in a good way, but I can't exactly tell from this new trailer. There's so much going on in this. Might be fun? Join in below. You can still watch the first teaser trailer for Game Night here, to see even more footage from this movie. Bateman and McAdams star as Max and Annie, whose weekly couples game night gets kicked up a notch when Max’s charismatic brother, Brooks (Chandler), arranges a murder mystery party, complete with fake thugs and faux federal agents. So when Brooks gets kidnapped, it’s all part of the game…right? But as the six uber-competitive gamers set out to solve the case and win, they begin to discover that neither this “game”—nor Brooks—are what they seem to be. Over the course of one chaotic night, the friends find themselves increasingly in over their heads as each twist leads to another unexpected turn. With no rules, no points, and no idea who all the players are, this could turn out to be the most fun they’ve ever had…or game over. 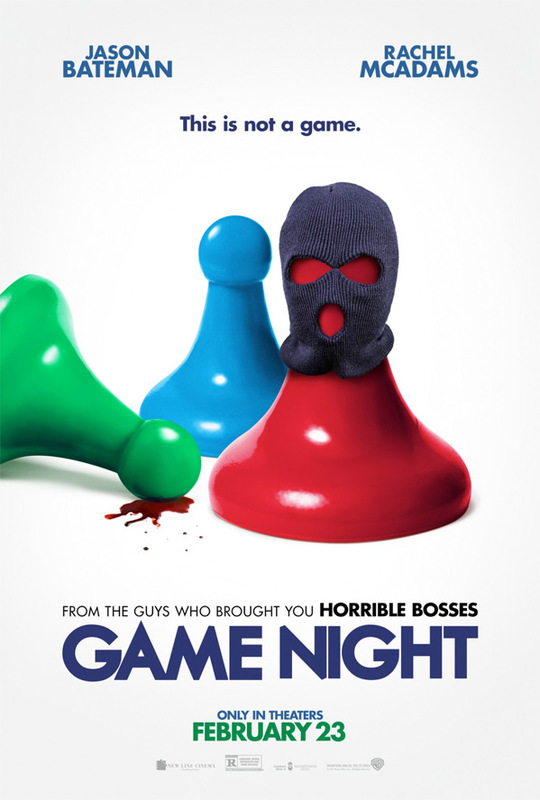 Game Night is directed by filmmakers John Francis Daley & Jonathan Goldstein, who last directed the Vacation reboot together previously. The original screenplay is written by Mark Perez. Warner Bros opens Game Night in theaters everywhere starting on February 23rd coming up. Who wants to play?